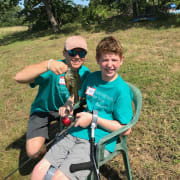 We are looking for Volunteer Camp Counselors ages 17-25 with big hearts for children with special needs and physical disabilities. Hope's Crossing Camp is a one week day camp, June 3-7. Volunteer training is Sunday, June 2. Each Volunteer Counselor is assigned one camper for the entire week. Counselors must be age 17-25, agree to background check and provide their own housing.